These are the new breed of electric scissors. 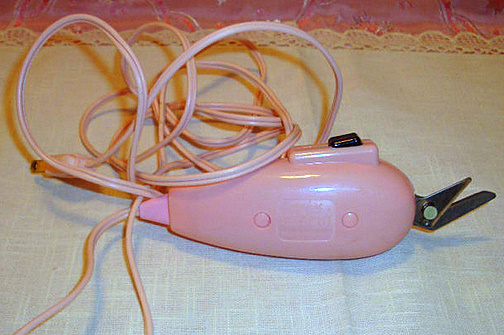 I say new because I had electric scissors when I was a kid, and they had a cord and were totally stupid. I had no idea what the point was because they wouldn't cut much besides paper. Today you have better options and the versions from Black & Decker and EC Cutter are the best. Cutting fabric (or anything for that matter) with electric scissors is like passing a hot knife through butter. I personally guarantee you will wonder how you lived without cordless electric scissors in your sewing room. The trick is to practice with them as they're so "sharp" that any wrist wiggle or extra movement is instantly transferred to your cut line. That being said they're perfectly safe for use around kids as it's next to impossible to get your finger into the actual cutting area where the blades come together. When you're the one using them they're so much fun you might be completely oblivious to the buzzing noise but it can be a little irritating to others in the vicinity. Learn to cut without resting the bottom blade on the table and they're quite a bit quieter. There are two related videos, the first is more or less a review of both tools. The second video is one I shot a few weeks ago as I was cutting out my last most recent pair of jeans. The audio was screwy on that so I dumped the original audio and give a pretty verbose voice over. Lucky you! Wow! I have my grandmother's old electric scissors packed away. I've had it for some time now but never had the desire to use them; Thanks for the inspiration! Perhaps I will send you a picture of it!? Love the blog by the way. Do you find these better than cordless cutters with flat plate? I found the flat plate to be cumbersome and kept me from being able to turn 90 degree corners. The EC Cutter comes with the shoe blade and I never use it. You can see this in the first video. I have a pair. I call him Zippy. We have a on again off again relationship. We used to be thick as thieves. But lately he isn't cutting as precise as he had been. Actually he tore some fabric that I had very little of. And he's useless on knits. I've been meaning to get a pair since you showed them to me back in the spring. Today I finally will! Thanks for the reminder! Wow Brian--great videos--for father's day I bought my dad (a beginning sewist--he bought a sewing machine in May and had never sewn a stitch) the electric rotary cutter and he doesn't like it. I sent him the link to your blog post and afterward he bought the B&D electric scissors on amazon. I think I might need to buy them too. I also enjoyed watching you cut out jeans--I learned some tricks there! I realize it's a lot of work to put the videos together and thank you for them! I envy you and your life, Brian! You have a hobby and job that you love rolled into one! Thank you for continually posting videos and teaching us. I found out that if you use a cardboard cutting board (a superboard or the like) as a cutting surface, there is very little angry duck sound left even if you rest the blade on the surface. Can I just say, this is why I love you? You share great things that ANY hobby addict would want to know about. We can live vicariously through you or get so all fired up and inspired that we have to try things for ourselves. I bought my mom that EC cutter years ago when she started having some hand problems...she freakin' loves it. Just found your blog tonight...watched your videos about the electric scissors and cutting jeans. Loved them both!!!! ...and I'm going to buy the EC scissors. Thank you soooo much!!!!!!! Thanks for doing this post about electric cutters. Cutting is one of my least favorite tasks during the whole sewing process. I was wondering if this would work on thinner, silkier/slippery fabrics? Like chiffon or charmeuse? Have you tried the cutter on such fabrics before? Do you think it would work if you alternately sandwich layers of fabric between layers of tissue, weigh it down, and use the cutter on them?